Every 10th and 12th JKBOSE student, attention please! Are you facing high pressure for your studies? We are here for all such students who are looking to know any resource to go easy with your studies. 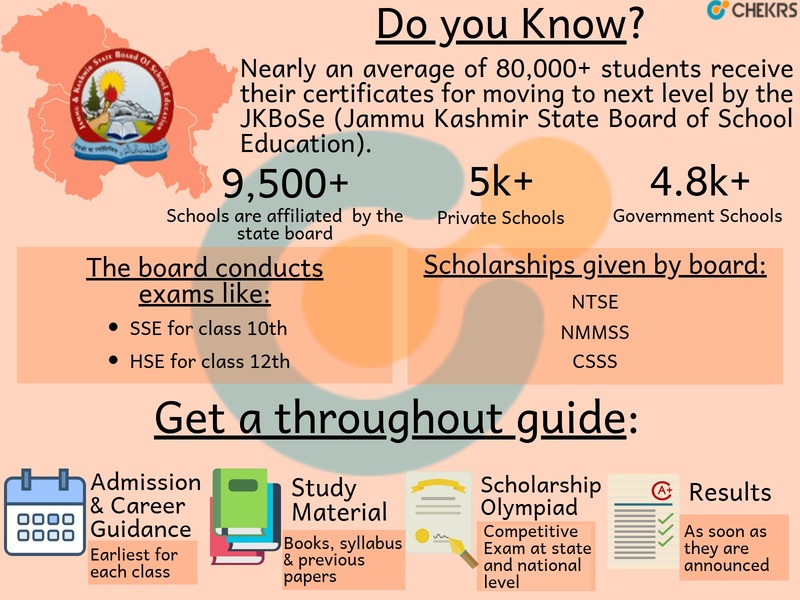 Know Your Board: The JKBOSE was established under Jammu and Kashmir State Board of School Education Act, 1975. The board of education has been looking after the examinations of secondary and higher secondary classes & grant students certificates for higher studies. The board also provides various scholarships such as NTSE, NMMSS & CSSS. Board classes are those phases where each student faces struggle to manage their studies while extracting time for other activities. Though the reasons of pressure may vary but one of the main causes is untimely updated given by the school staff for heading examinations. Visiting and following Chekrs gives every student benefit to know examination through JKBOSE Calendar and prepare for it in advance. Here, all of the students can access their JKBOSE Time table as soon as the board announces them. Not only this, you are comprehended with study material like JKBOSE Syllabus and JKBOSE Books pdf. At last, you can even complete and predict your results through JKBOSE Previous Years Papers. Nowadays besides regular studies it is very important for each and every student to increase their skills more. One such way for all is the scholarships and Olympiads which helps desirable student give better platform. Interested students are hailed here to get details of Jammu and Kashmir Scholarship Scheme, national level Olympiads and how you can apply for them timely. Why Chekrs for JKBOSE Class 1st to 12th ? More than an online portal, Chekrs proves to be your education partner which delivers you complete assistance. For the same besides keeping you update, here you can also get career guidance for knowing the information of which subject to choose after 10th and what possible courses are available for specialization after 12th.